Lille Suprem Pants Extra are pull up pants with a built in pad, designed to be worn just like normal underwear. The pants are ideal for managing moderate incontinence. The pants are comfortable and discrete, and the inclusion of a textile back sheet ensures a high level of absorbency. 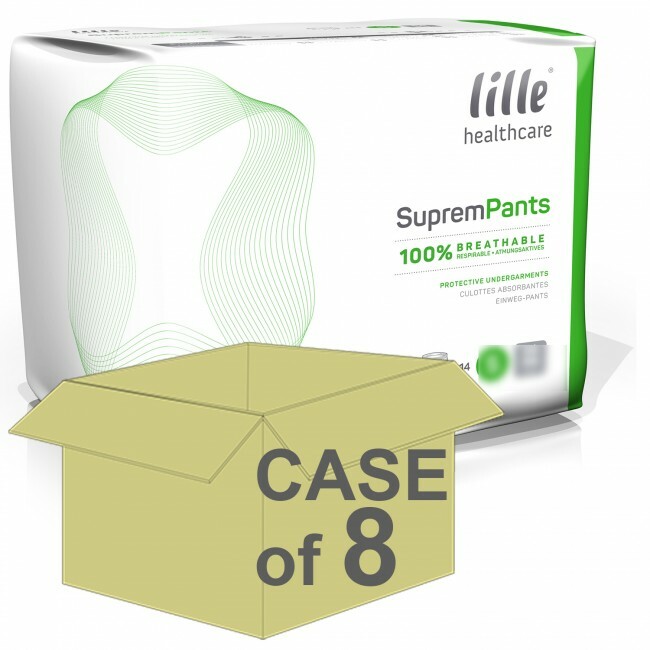 Lille Suprem Pants Extra are easy to put on and off, and are especially ideal for active and independent users. A special wetness indicator is included in the pants, acting as a useful guide as to when the pants need changing. This indicator in the pants effectively turns blue when there is a high level of saturation. The pants are latex free, and are designed with an 100% breathable formula which is kind and pleasant on the skin. A special odour control system in the pants allows you to relax and enjoy your day without the worry of any unwanted odour. The pants can be worn just like normal underwear and are a comfortable and subtle solution for managing moderate incontinence.